Saudi Arabia’s King Salman has said that the Palestinian cause remains his country’s “number one priority”, while calling on the international community to halt Iran’s regional activities which “threaten security and stability”. Saudi Arabia deems groups like Hezbollah and Hamas, both of which have engaged in military conflict with Israel for decades, as terrorist organisations. 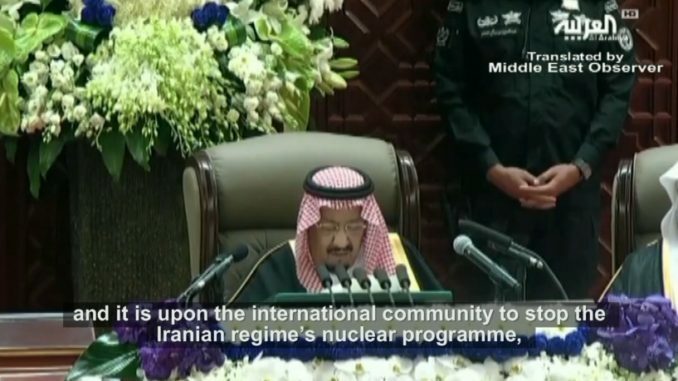 Salman was speaking at his annual address to the consultative Shura Council. The Kingdom will continue to counter extremism and terrorism, and to carry out its leadership and developmental role in the region, which will increase investment opportunities. It will also continue its efforts in resolving the region’s crises and its (core) issues, and the Palestinian cause will remain our number one (priority) until the Palestinian people attain all their legitimate rights. The Iranian regime has persisted in interfering in the internal affairs of other states, and sponsoring terrorism and spreading chaos and destruction in many regional states, and it is upon the international community to stop the Iranian regime’s nuclear programme, and to stop its activities which threaten security and stability.